Packing: two pieces a polybag, 100 polybags a carton. Turn your toaster into a grill with Reusable Oven & Toaster Cooking Bag. Slide a sandwich into the non-toxic, non-stick bag and toss it in your toaster. Within minutes, you'll have a perfectly toasted and delicious sandwich. Ham sammies, grilled cheese, paninis, pitas, garlic bread, pizza slices, and even bacon can be cooked in your toaster. Each Reusable Oven & Toaster Cooking Bag can be reused up to 50 times and you get two bags with each order. Heat resistant up to 500°F, Toast Bags can even be used on your indoor grill. 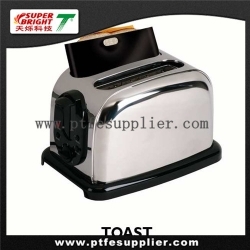 Your toaster and grill will always remain clean when you use toasting bread bag . The Reusable Oven & Toaster Cooking Bag can also be used to heat pastries, pizza slices and chicken nuggets, among others. Copyright © NINGBO TIANSHUO (SUPERBRIGHT) TECHNOLOGY CO. LTD., All rights reserved.